Track list:same as the original, plus the Barabajagal album track list. 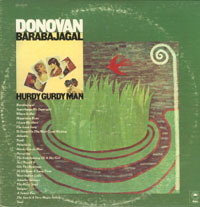 Trivia: double record that includes The Hurdy Gurdy Man and the Barabajagal albums. · This is part of a Box Set called Four Donovan Originals, released in the UK by EMI, on October 24, 1994, containing four Donovan albums that were never released before in the UK: Sunshine Superman, Mellow Yellow, The Hurdy Gurdy Man and Barabajagal. The US version of The Hurdy Gurdy Man is the third disc of that set. All bonus tracks by Donovan P. Leitch. * Non original albums versions. · Colours and Catch The Wind are the versions that appeared on the 1969 compilation Greatest Hits. Epic wasn't able to get the rights to the original recordings, so Donovan had to record them again. He included a full backing band on these tracks and sings with a softer voice than in the original songs. · Lalena was released as a single and had a big success, despite its slowness. The B side was Aye My Love, which is not the same version as the bonus track included in this reissue. 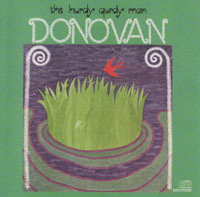 · The original title of Poor Cow was Poor Love, but Donovan changed the name when the song was used in the movie Poor Cow.